Properly venting your kiln reduces your potential exposure to toxic fumes like carbon monoxide and sulfides. Be aware and be safe for happy firing! Skutt's Enviro-Vent 2 allows you to vent your kiln with no vibrations transmitted back through the body of your kiln to your ware inside because the motor is now mounted away from the kiln. It mounts either on the floor (in a floor-mount bracket) or on the wall with the exit ducting. The redesigned plenum cup is spring-loaded to ensure contact at all times with the kiln base. This helps assure a leak-free seal for better venting and even fewer firing fumes in your kiln area. KM2480 Skutt Enviro-Link Vent Controller Skutt Enviro-Vent II Skutt Enviro-Link controller for the Enviro-Vent II kiln ventilation system on KilnMaster kilns. Is the Vent Worth the Cost? Kiln manufacturers have long recommended that firing areas have adequate ventilation. Our current environmental and green consciousness has created more awareness of potential health hazards than ever before. Studies have shown that carbon monoxide emissions can exceed OSHA Threshold Limit Values during bisque firings in electric kilns. Formaldehyde and sulfur dioxide may also be present. Because of these concerns, kiln venting is required by building codes in most areas. If your firing chamber is not properly vented, your work is also likely to suffer. Ceramic and glass materials contain organic compounds. The first phase of the firing process burns these compounds into gases and vapors before the changes at higher temperatures occur. These contaminants need to be removed from the kiln and replaced with fresh air. This is especially important with some red, orange, brown and yellow glazes, and with metallic lusters, because they need oxygen for good color results. 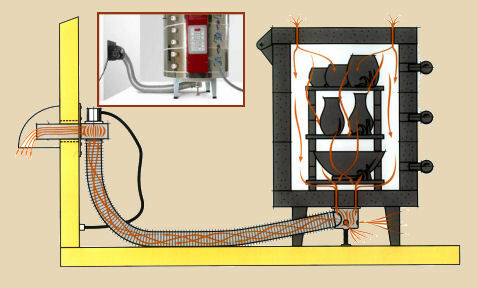 An additional benefit of using the Enviro-Vent 2 is that you can now vent TWO kilns using only ONE motor! You need only a dual exhaust vent kit for the second kiln. The combined capacity of both kilns cannot exceed 24 cubic feet -- but that's enough for two Skutt 1227 kilns! The Enviro-Vent 2 comes with a 6-foot section of 3-inch flexible aluminum pipe which joins the plenum cup to the vent motor. a 4" adapter also comes with the kit so you can attach standard 4" ducting to the vent exit pipe. Ducting from the end of the exit pipe to the outside air is not provided with the kit. You can easily purchase extra 3" pipe or standard 4" dryer duct pipe at your nearest local hardware or home improvement store.